A part of the Bang & Olufsen complete home entertainment solution is the light control system which allows for the adjustment of light-settings of a single lamp, room or entire house with a Beolink® remote control. You can also program local and global light-settings so that when you press 'LIGHT' and '1' on the relevant remote control all the lights in the room adjust to their preset lux-settings which are stored in memory-location '1'. Nine local light settings can be stored with the dimming of each light unit being made individually. Each light which should be included in the light programming must have an LC2 unit (the latest device) attached to them. It's a small white, slim box with a dark glass 'eye' in the middle (see below). The 'eye' also operates as a tactile on/off switch - by touching it the light turns on or off; by keeping a finger on it the light dims upwards and downwards gradually. The light-control units were also timer-programmable through two-way communication with the audio master (Beosystem or Beocenter) acting as the timer-host. In this way you could set the lights to dim when, for example your favourite TV-series began and the Beovision TV turned on! Unfortunately, since the demise of two-way communication in the mid-1990s this is no longer possible. A completely new style for the light control and a very much improved design compared with the LC1. The new shape allowed for its placement in line with the wire of a pendant fitting and easier wall mounting (see below). Installation was also much easier than the LC1, which had rather fiddly terminals in a confined space. Instead, LC2 had plenty of room and the connections were accessible and clearly marked. 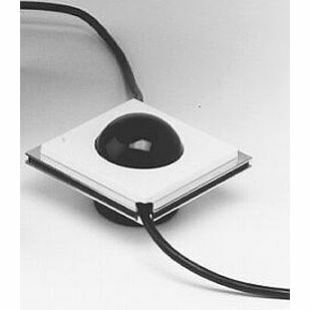 The touch field was retained, but was now part of the infra-red receiver dome and offered the extra function of dimming the light if it was held. The most important improvement was the ability to control fluorescent and low voltage lamps, which the LC1 could not do, as well as standard bulbs. However, for fluorescent and energy-saving lamps the LC2 had to be reprogrammed to only perform an on/off function. In use, the LC2 is otherwise identical to the LC1 and both types of control can be used in the same room. LC2 is controlled by the use of remote control Beo4 although works equally as well with previous remote control models. Halogen lights may be used with LC2 (but not LC1) together with the dimmer function. The dimmer function cannot be used with fluorescent bulbs including energy saving bulbs (which are based on the fluorescent tube principle). LC2 has been through a new approval process and as a consequence it cannot be used with low voltage halogen bulbs, low energy bulbs or fluorescent tubes. It is approved only for connection with standard filament bulbs. LC2 will continue in its current form only and there are no plans to update this product. Since the introduction of plasma range of televisions, LC2 users may experience problems when poor, or no remote control, over the LC2 unit when a plasma monitor is turned on in the same room. This is caused by 'noise' from the plasma monitor (light noise (370 kHz ) as well as electrical noise from the plasma monitor). The noise level is approximately 20dB stronger than the IR codes from the IR terminal. This is typically a problem in circuits using the IC-type U2506 (no AGC) in that 370kHz IR light from the plasma monitor is disturbing the 455kHz carrier wave for B&O IR codes. The solution to this problem is to consult your B&O dealer who will replace PCB1 part no. 8000664 for an updated version.